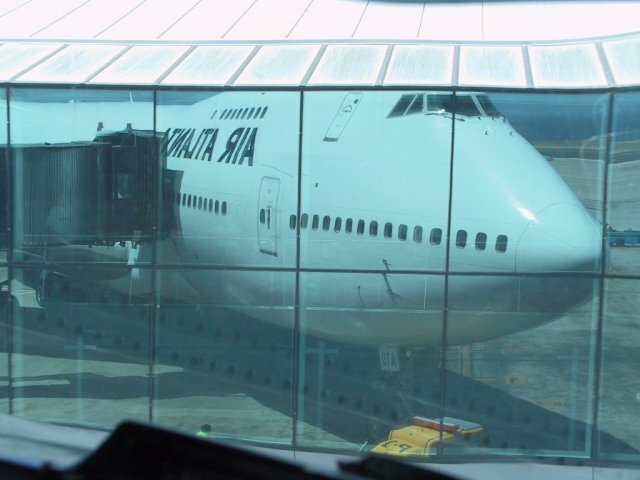 Since a lot of people find the 747 interesting, I thought that I'd get together my collection of pictures of it. Not all of them are the usual lot though, and that's because I've taken odd ones that you normally don't get to see. This is a projected three engined version of the 747SP. It was not taken up, but perhaps it would have been a good thing. The thinking behind the three engines was that for such a (relatively) small plane, only three of the big turbo-fans would be needed. They of course ended up still using four. 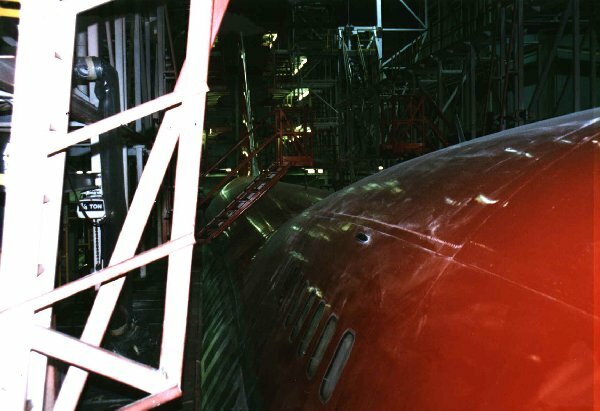 Here's a rare-ish picture - I was in the Northwest Airlines maintenance hanger in 1995, and got to see a 747-200 being worked on extensively. There was a few levels of scaffolding around it, so I climbed up the top and took a picture of the 'Top of the Whale', as the Americans call it. In my job with Air Atlanta Icelandic, I get to travel to many & varied places. One of those odd trips was from Hannover in Germany to Calgary in Canada. 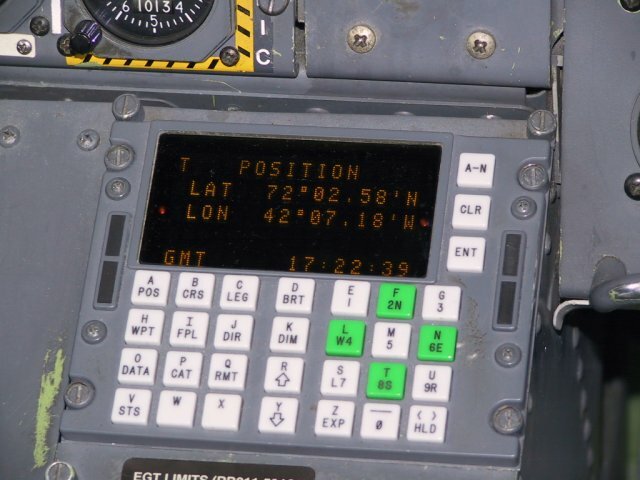 The direction that we flew, to cover the least distance, had us flying quite some distance north of the equator - In the picture you can see that we're actually 72° north here, and at 42° west that puts us around the middle of Greenland. When flying at altitude in the 747, we normally cruise at Mach 0.84 to 0.855 odd, but occasionally we get some atmospheric variations that can cause the Mach number to briefly read higher than what the plane was cruising at only a few seconds before. This is one of those times. 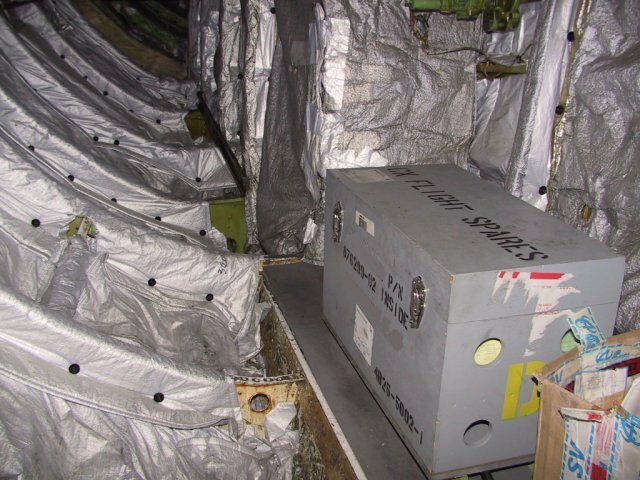 In March 2002 the company was handing back a 747 to the owners at the end of one of the contracts, and part of that hand-back procedure is to test many of the systems on the plane. 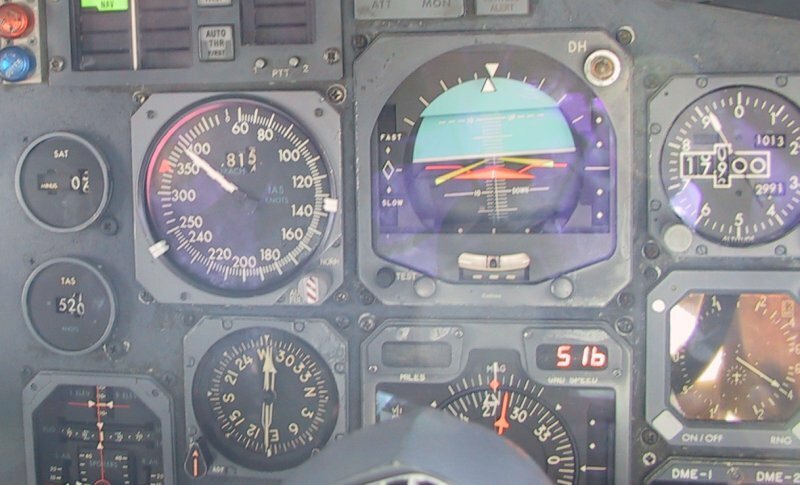 One of the test is to check that the high-speed warning 'clacker' lets out a loud noise when the plane is at the limiting indicated airspeed and also when at the limiting mach number. So I was pretty happy they picked the right guy to test them. 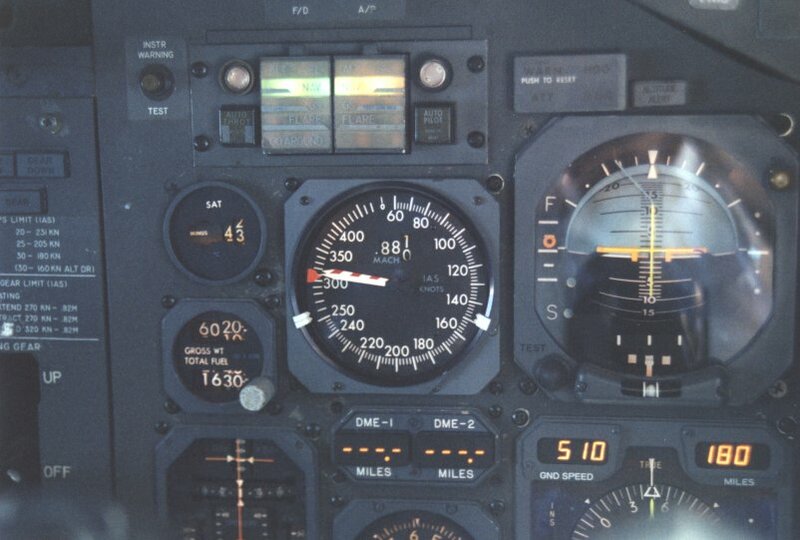 On the left you can see the plane is doing 390 knots indicated at 17,900', and has a true airspeed of 520 kts. On the right, the plane is doing mach 0.915 which is 550kts. This is scary-fast for a 747 and I've never come close to going that fast since. 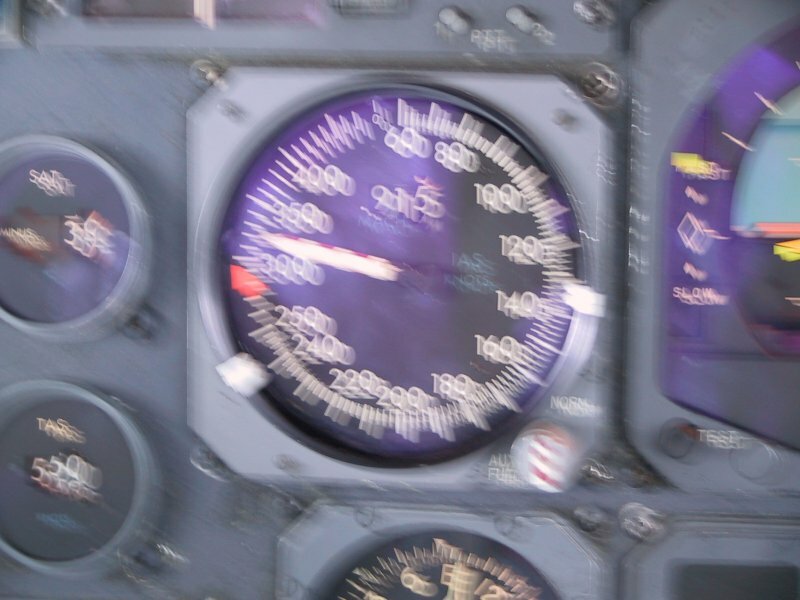 Note that the blurry photo isn't from the plane vibrating - It was absolutely smooth - it was merely the camera not focusing properly. The big aeroplane is capable of going much faster though as Boeing has tested the prototype to M 0.991 or only 5kts below the speed of sound. After a few hours in the cold atmosphere cruising along, the throttle cables that run from the bottom of the throttle all the way out to the engines all shrink slightly different amounts, and so to get the same RPM's you often have the throttles sitting at odd angles to each other. This is what they looked like on descent from 37,000' one day. This is one of the 'outflow valves' that sits in the tail of the plane. The engines let in a pretty regular flow or air into the cabin, and to control the pressure in the cabin these valves are very accurately controlled automatically to regulate that pressure. One or both can be controlled manually. 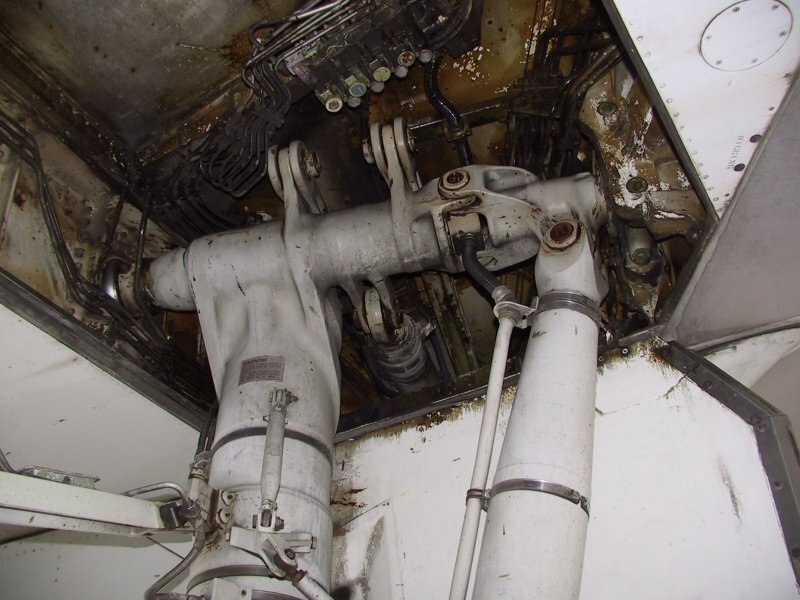 The dirty appearance of the panelwork on the exit of the valve is mainly due to smokers in the plane and their cigarette smoke leaving a stain on the paint. In the tail of the 747 sits a small jet engine. When I small though, I mean that it's relatively small - it's actually much the same as a Learjet engine, and in fact is a modified one of those to provide a large volume of air to run the air conditioning and start the engines. It also has two electrical generators on the front (not seen in the pic, though if you look carefully you can see the mounting pads) that also power the plane on the ground. Each generator is exactly the same as the ones on the engine, and can be swapped if need be for that reason. Apologies for the quality of the picture, but I had to take it at a fair angle through the front windscreen of the plane and that always distorts the end result. 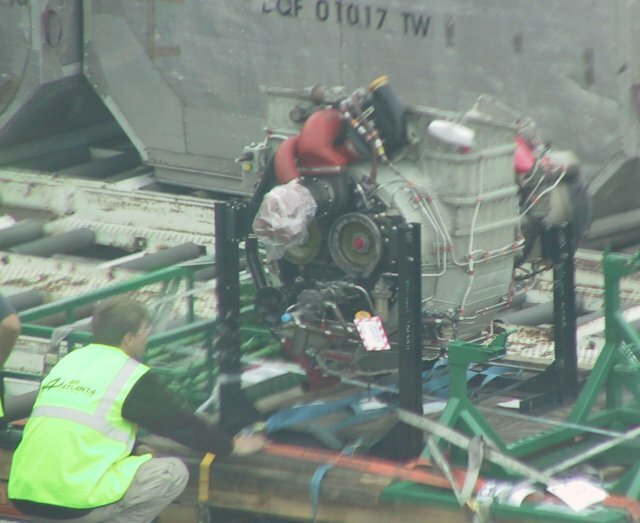 Speaking of the APU in the tail, the small opening that you can see there is the air inlet for it. The APU is normally only used on the ground, though on extremely hot days you can run it on take-off (it's normally shut down just before entering the runway) to run the air conditioning to help keep the plane cool. It's not allowed to be started in flight though, nor any electrical power generated from it. 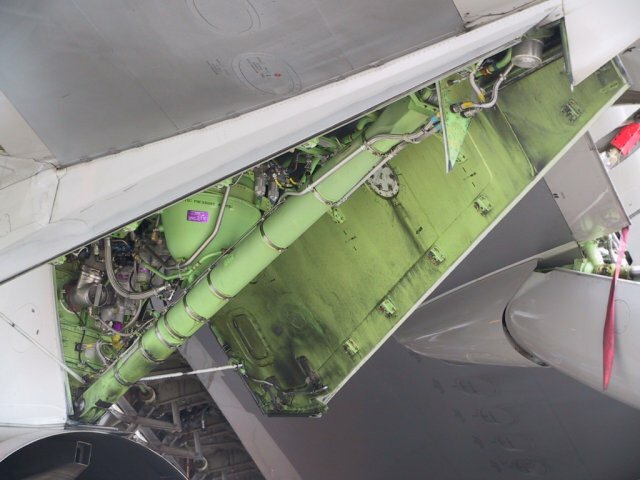 If you look just below where the APU sits, you can see the servicing doors. The APU can be changed away from the main base, by means of a small winch that bolts up into the tail to lower the old one, and to winch up the new one. However, you still need a three storey tall ladder to work on the connections! In the lower picture you can see the large exhaust pipe it uses, just below it the two white navigation lights, and below them the strobe light for the tail. Remember that movie 'Executive decision" with Kurt Russell, where the good guys stormed into a 747 by going up the avionics bay through the bottom of the plane? 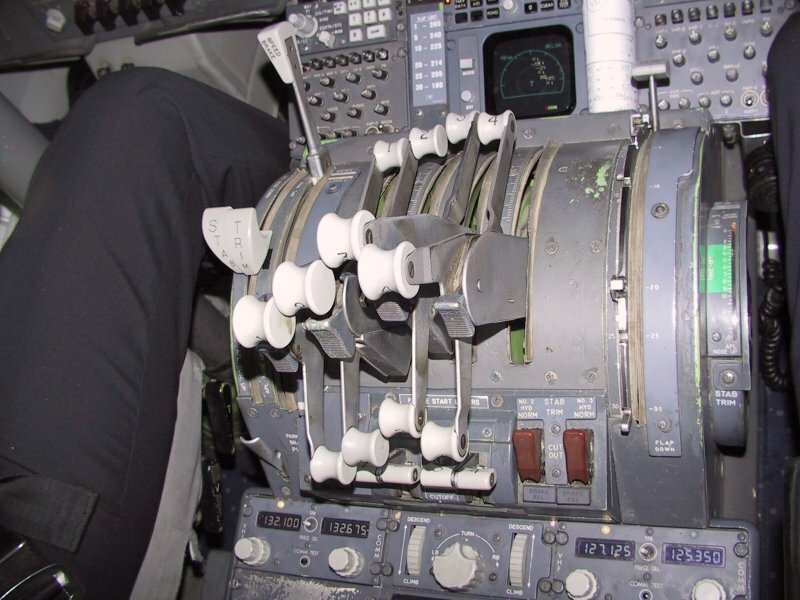 Well, not surprisingly Hollywood took just a little licence when they made the mock-up of the real avionics bay. It's maybe 1/4 the size of the one in the movie. It's perhaps 1.7 metres tall, and about 60cms wide, but goes the full width of the plane. Yes, in the floor there is a hatch and I'm nearly standing on it here to take the picture. 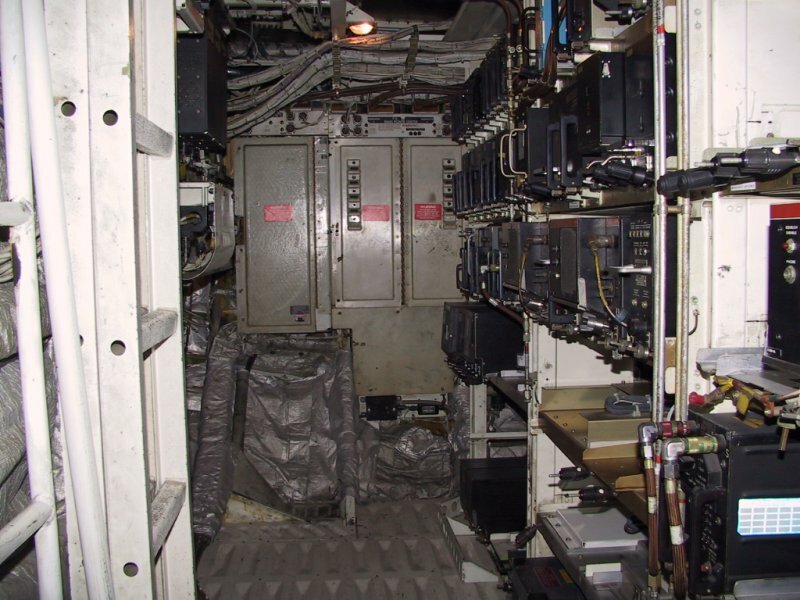 I got into the bay by going down the other hatch, which is a removable panel in the floor of the passenger cabin, just in front of the #1 door on the left hand side of the plane. You can see the racks of boxes that control our instruments, systems, and navigation gear. They're on racks like that so they can be swapped quickly & easily. To push the 747 back from the parking gate, a very powerful tug is needed. You can use a smaller tug, but with the engines running they can easily overpower a smaller tug. Even the bigger ones that weight up to 70- tonnes can have trouble on icy surfaces, and so great caution is needed on days like that from both the flight crew and ground staff. 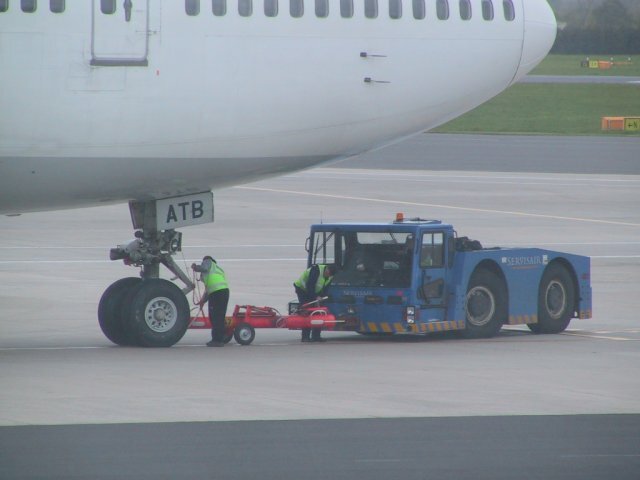 You can see the big tow-bar that is used to connect the tug to the plane's nose-wheel strut. The handle that the chap on the right is working on is the hydraulic ram that raises & lowers the tow-bar so it can be connected and released from the strut. 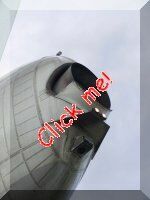 You can also see the (relatively) small 'turn-off' lights that're on the strut, and are used to light up the taxyways off to the side as you come up to them at night. Also note the size of the wheel compared to the size of the person nest to it - FWIW, the nose wheels are exactly the same as the main wheels and so are interchangeable. 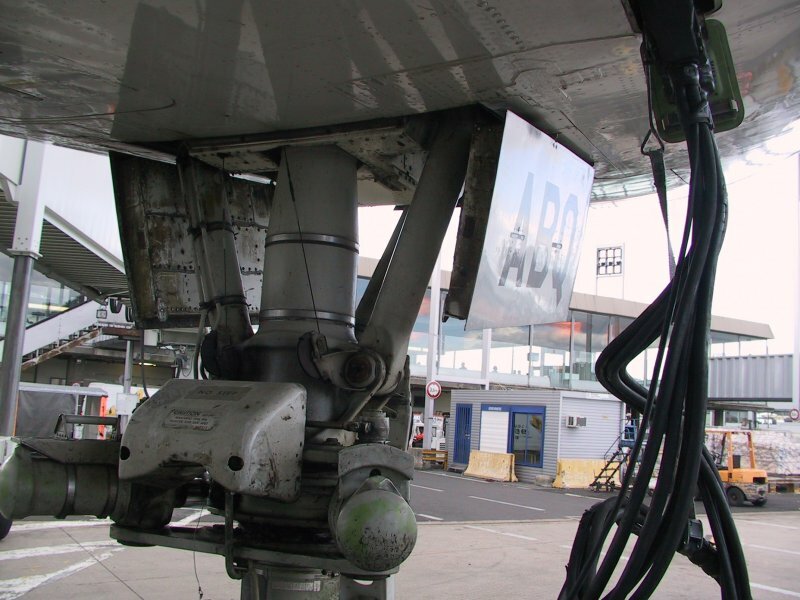 In the lower picture you can see the hydraulic rams that make the nose wheel turn, and if you look carefully you can also see the small wires that come down from the gear bay to control the rams. The thick wires on the right are the ground power connecters, and can pass over 1,000 amps. We can get by with one, but two is better. Speaking of tugs, this is the way they they're heading - No tow-bars at all. The big claw gadget that you can see on the left of the picture goes around the nose-wheel, grabs it and pulls it forwards onto the small pad near the centre of the claw mechanism, then the whole lot lifts the nose-wheel by about 30cms so the whole front of the plane is supported by the tug. It's a far more secure and better arrangement all round, and of course is a lot safer as well. The one pictured is a 737 tug in Dusseldorf, Germany, but one used to tow a 747 is not a great deal bigger, just with bigger tyres & so on. Because the weight of the plane is on the tug, it has far greater traction and manoeuvrability than the older types. 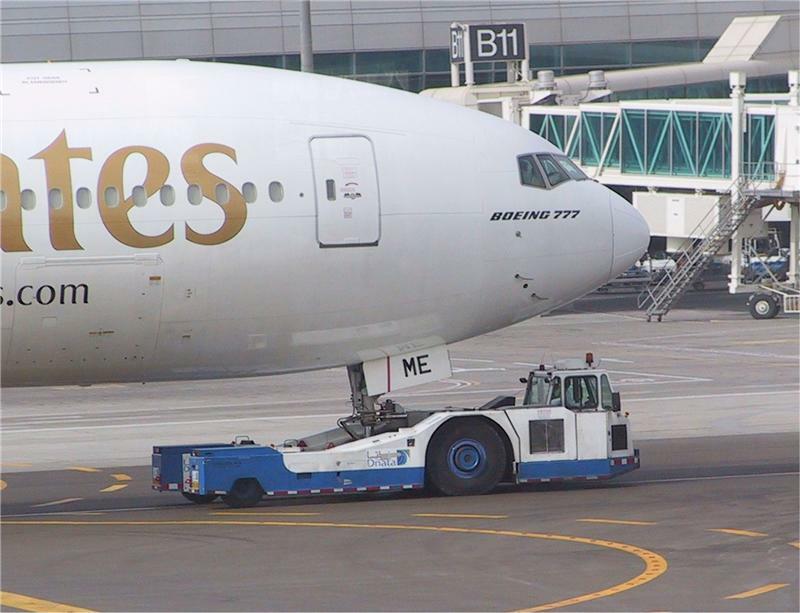 On the right is one in action, towing a Boeing 777 in Dubai. On the upper deck there are one and often two escape doors, though you'd have to be pretty desperate to use them! This picture was taken from one that I opened up when in Paris, due to the APU not working and so the plane was getting rather warm inside. (Hence the picture further up the page of the APU that we took to Algiers to replace our broken one ..) The windows that you can see are the First Officer's ones. You can see the skin patch used to strengthen the skin around that part of the fuselage. This is pretty normal for the older 747's, and is part of the common 'Section 41 mod'. If you look very carefully at the bottom of the window you can see the end of the windscreen wiper. This is looking back the other way. You can see the wings drooping a little from the fuel making the bend down, and this helps them from bending too much in flight. Looking down you can see the forward cargo door open. 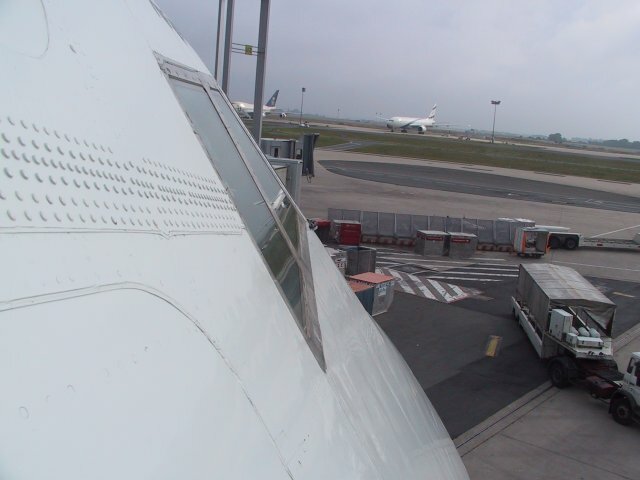 The plane is parked at 'Satellite 2' at Paris's Charles-de-Gaule airport, with Satellite 3 on the left side the picture. Here are the inlet ducts for the #1 and #2 pneumatic air conditionskits, or as they're known by the crews as 'packs'. You can see the variable geometry doors that control the airflow into the packs to adjust the amount of cooling air that goes through them. On the ground, they default to the full-cool position that you can see here. In flight, depending on the requirements they may be less than 50% as open as that. The #3 pack inlet is right over on the other side of the fuselage. The pack exhausts are just in front of the landing gear, and are almost impossible to see in this picture unfortunately as they're very nearly flush with the skin. Though if you look very carefully at the landing gear on the far left of the picture, just a little to right of where the strut goes up into the body you can see a small raised section, and that's the exit louvres for the #3 pack. Here's the inboard, or as it's known, 'body-gear'. You can see the brakes on the main wheels, and of course each main wheel has a brake like that. Each brake assembly consists of eight discs and nine brake pads, and the brakes pads cover the entire discs all the way around. 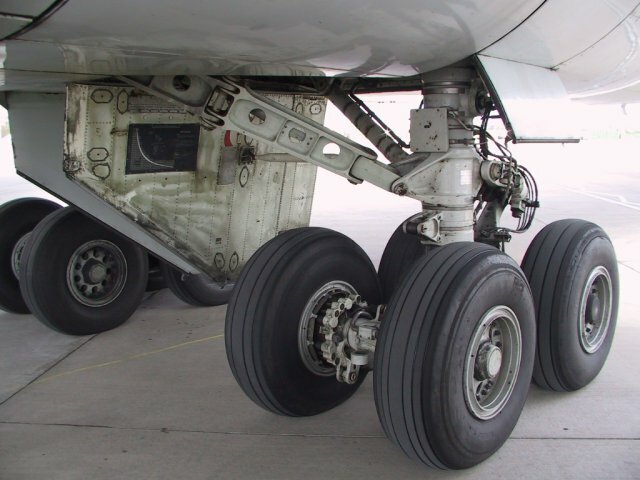 The bottom of this assembly actually turns in the opposite direction to the nose-wheel when turning tightly, to help reduce the scrubbing of the body-gear tyres and to also reduce the turn radius required. The black panel on the gear door is a table to work out the pressure in the strut relative to strut extension. The middle picture is also of the body gear, and it more clearly shows the big hydraulic steering rams. The lower picture is of the left hand wing gear, up around the massive hinge area and it shows the big hydraulic rams that move the strut up & down. The big strut on the left is about as thick as a man's body. 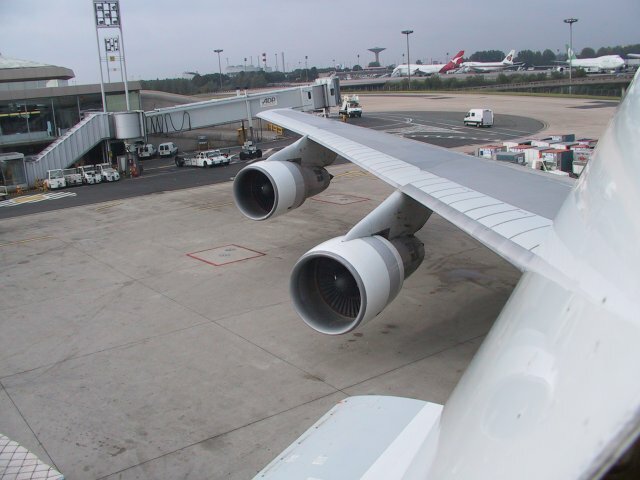 This a picture up the rear of a Rolls-Royce RB-211 60,000lb thrust engine, operated by Cargolux of Luxembourg. 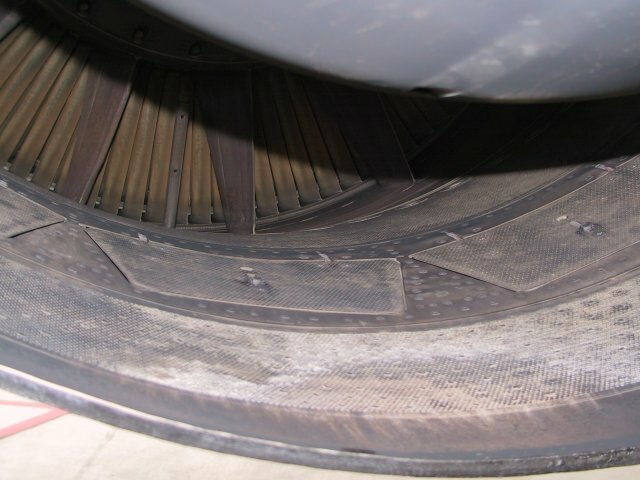 You can see the heavily wrinkled diffuser that helps blend the very hot & high-speed air coming out of the turbine section into the cool & lower-speed air that comes from the big fan at the front of the engine. 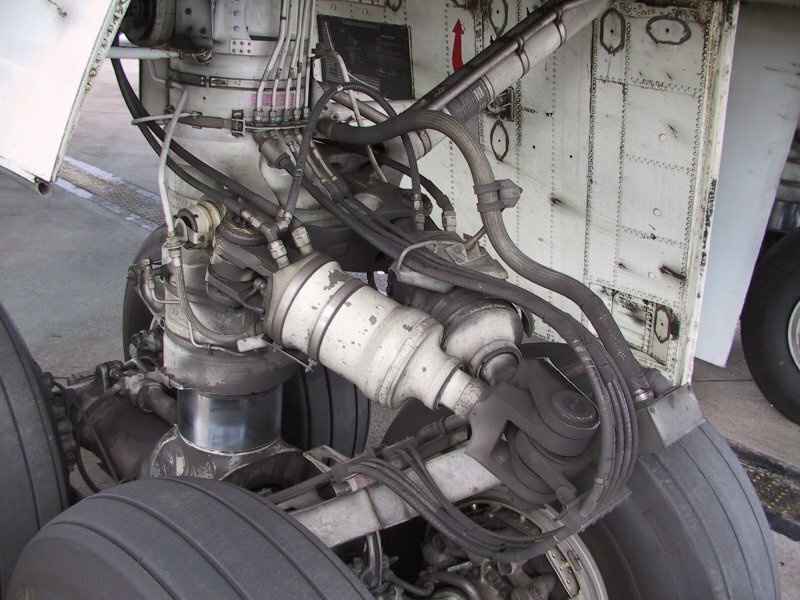 By helping diffuse the air like that, it reduces the total noise of the engine quite a lot. The older engines don't have this much effort to reduce the total noise and so even though they make less power they make more noise. A lot of people often wonder how the engine is put 'in reverse' on landing to help the plane slow down. It's done by a clever mechanism that lives in the side of the big part of the engine cowling, and the parts that you can see here are called the 'blocker doors'. 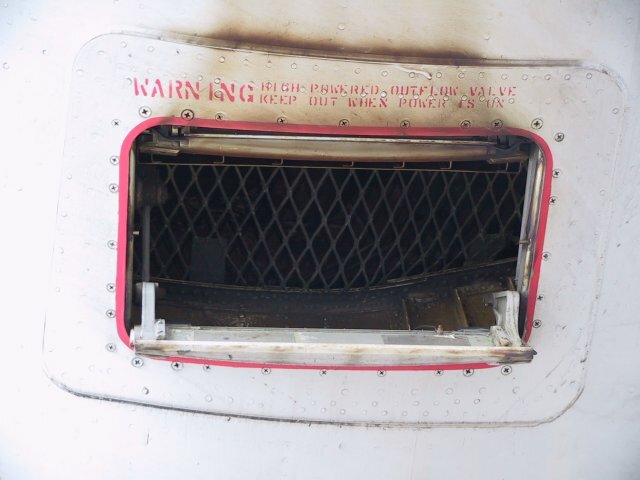 They are hinged in the middle, and when reverse is selected they bend up in the middle (the end of the parallel part) and come out until they block off the airflow from the big fan at the front of the engine. 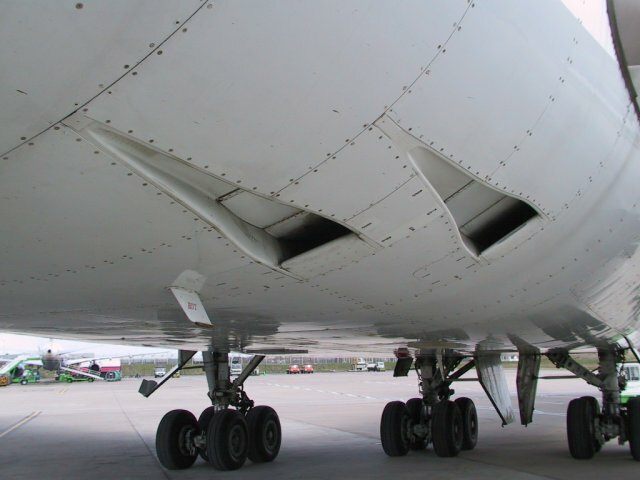 At the same time as they're moving inwards to block the airflow, the back half of the outer cowling (called the 'translation cowling') is moving backwards to expose a set of vanes that are angled forwards to direct the air that the blocker doors are stopping forwards, and this is the air that generates the reverse thrust. 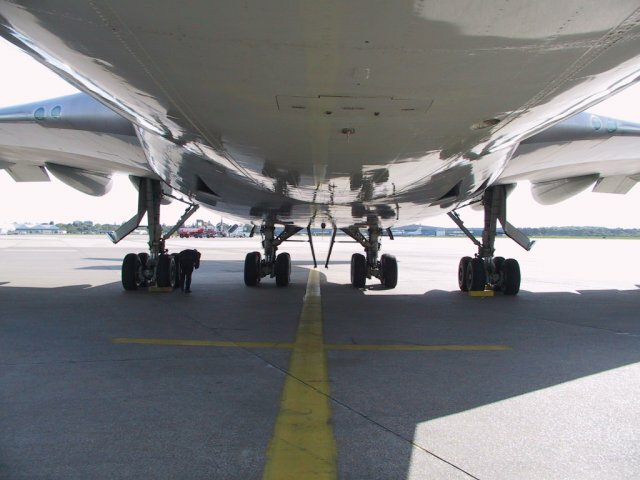 The air comes out at an average of about 45° or so, and can slow the plane at a rate equal to that of light braking. 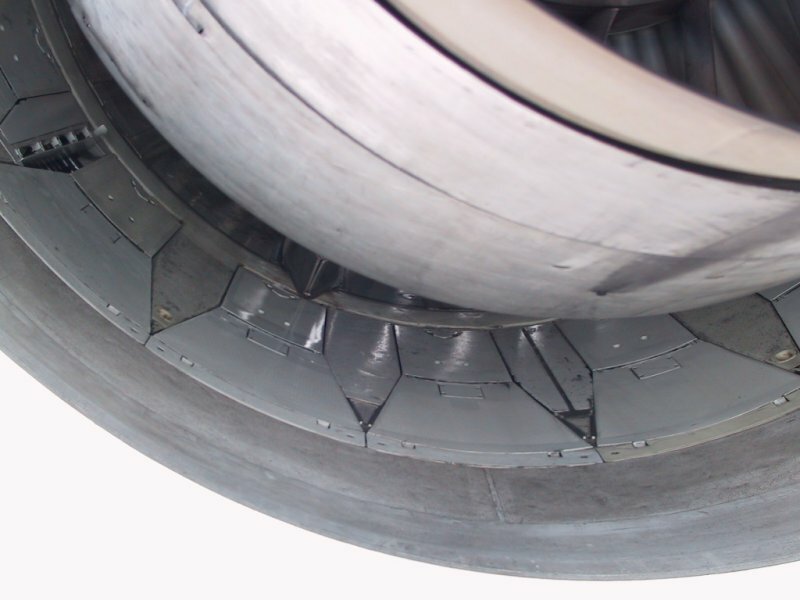 The braking effect reduces as the forward speed of the plane drops though, and in fact we have to get out of reverse by 60kts to avoid the engines sucking up debris from the runway and also hot-air re-ingestion. 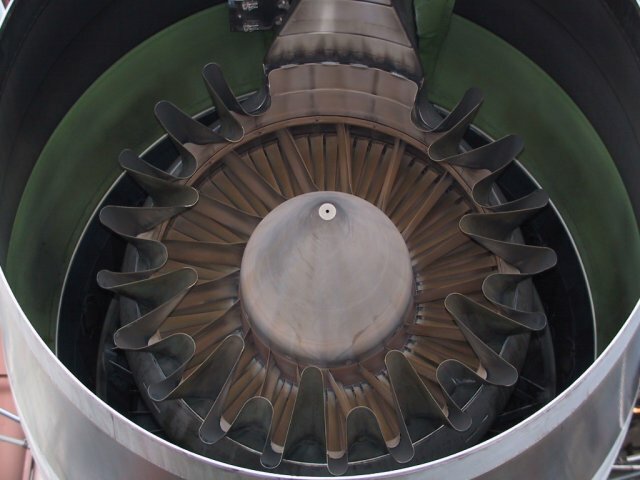 The early Pratt & Whitney 747 engines also had 'hot stream reversers' which are exactly the same thing but in the back of the turbine section of the engine, but since the big fan makes about 80% of the total thrust the extra complication was deemed to be not necessary on civilian aircraft. Some military type still use though, such as the C-17 transporter. 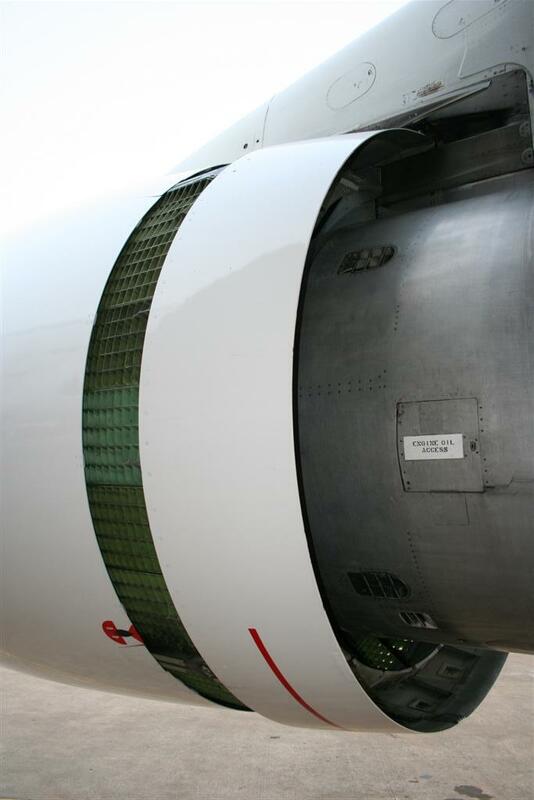 In the lower picture on the right you can see the bolted-down hot stream reversers. 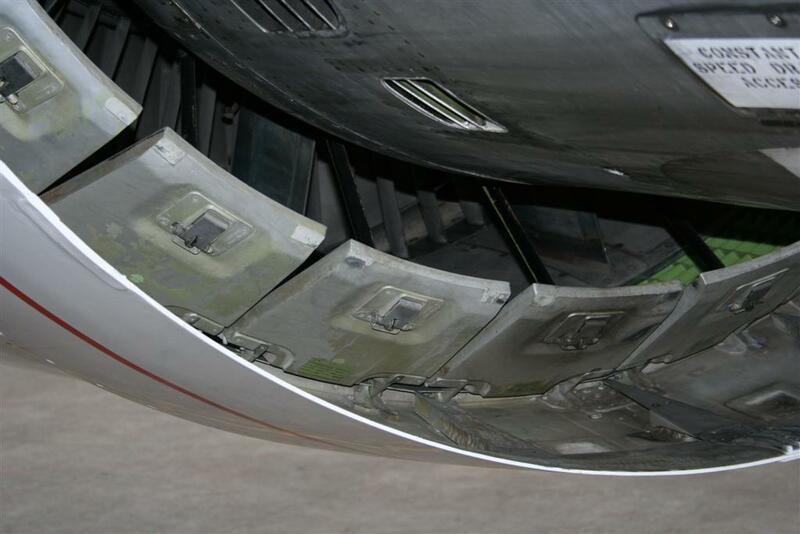 The upper picture is of the cold stream (fan) reverser doors of a Rolls-Royce RB-211-524-C2 engine. So, what happens on landing is that the reverse selector levers are pulled in the cockpit which moves the blocker doors and translation cowling and when they're in position the reverse lever unlocks to the second stage which allows the pilot to pull the lever up to rev the engine up to make reverse thrust. At no point does the engine stop and spin the other way. Thrust reverers aren't the most reliable device. It's not uncommon to have one jam halfway when it begins to stow, and so it either has to be manually wound back to the stowed position or if that doesn't work partially pulled apart to get all the sections stowed then locked-out until it can be repaired properly. In these two photos you can see the blocker doors stuck halfway and the translation cowl also stuck about halfway. 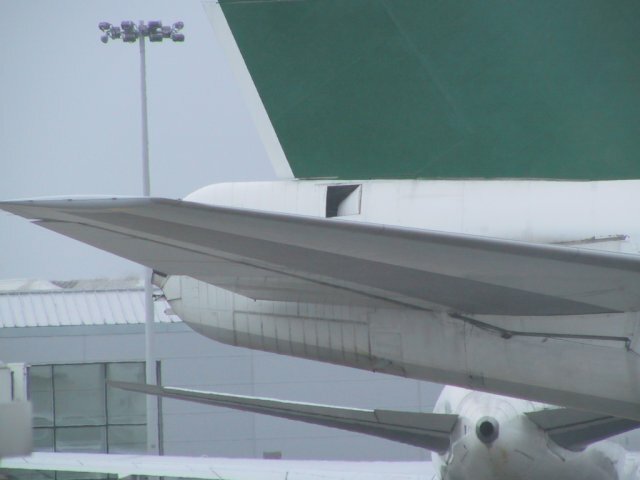 You can see the green guide vanes that help divert the cold stream airflow forwards, to produce reverse thrust. This is the rear engine mount for the 747 engine. This particular one is a Rolls-Royce, but they're all much the same. Surprisingly small, but terribly strong indeed. Just above the bar you can see the hydraulic reservoir for that engine. (I think that this is the #2 engine) and also just in front of that the air-driven hydraulic pump that supplements the engine-driven hydraulic pump. Okay, for those budding airport designers out there, THIS is what we want! - A nice, shiny mirrored front to the terminal so we in the cockpit can see what's happening down on the ground. This picture was taken at Tenerife South airport, and I also got the picture below this one there taken at the same time. 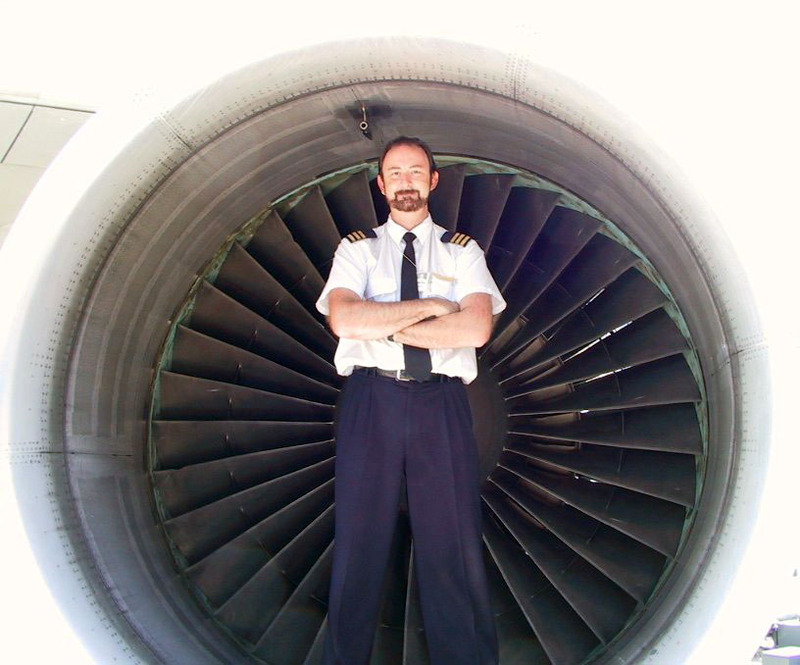 I've always wanted to get a picture of me standing in an engine, as just about all the 747 drivers have one, so I took off my shoes and hopped up into #2 engine and got the Flight Engineer to take my picture. So there I was, with a dopy grin on my face when I realised that all those people standing up against the mirrored glass in the picture above where my next load of passengers ... oops! The piloting types might notice some lumps & bumps in the fan blades, but this this pretty normal for an average engine and nothing to worry about. And no, girls, my bum isn't that big it's just the angle that the picture was taken, trust me! 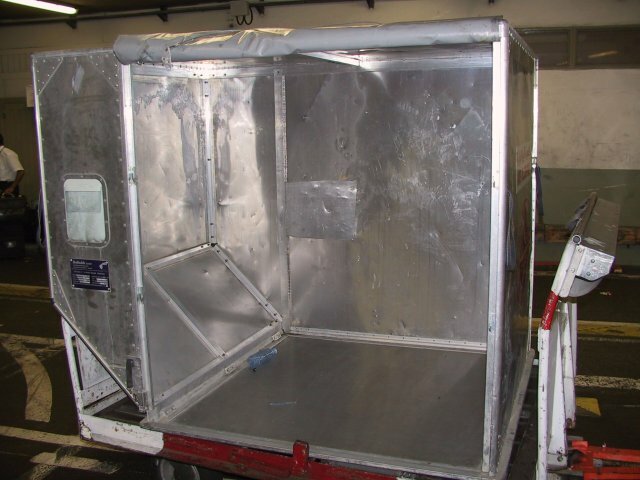 When you check-in all your bags, they eventually end up in an 'LD3 container' just like this one. 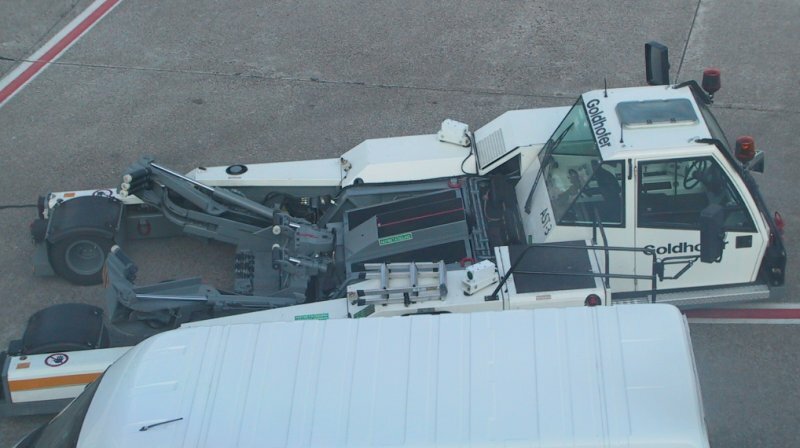 It's a palletised system that's used to make the loading & unloading of the plane faster & easier. The angled edge on the left hand side you can see is because the floor of the cargo bay isn't as wide as the total width of the bay, and so to fill up all the space they're angled like that. So no, unlike in the movies you can't move between the containers as they're hard up against each other and locked down. The pallet is about 1.8 metres tall I think.